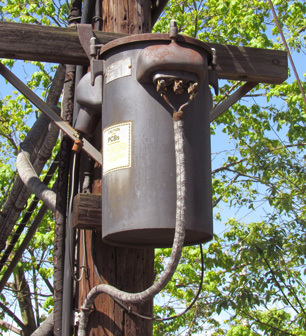 PCBs can often still be found in old power transformers. PCBs are a group of organic chemicals formerly used in a wide range of industrial and commercial products until their United States ban 1979. Products that may contain PCBs include electronics, fluorescent light ballasts, insulation, paints, caulk, plastics and carbon-free copy paper. PCBs arrive in water primarily through runoff from landfills and discharge from chemical waste. The EPA recommends granular activated carbon (GAC) for the treatment of PCBs.